Key Difference: Travelers check are pre-paid pieces of paper that have currency stamped on them. These currencies were in numbers such as 20, 50, 100, etc. and can be used as a normal currency. Prepaid Forex Card work as credit cards or debit cards and they even look the part. Small 3.5” cards that can be loaded with any currency and sometimes with multiple currencies. The biggest concern of a person when travelling abroad is currency. Carrying around a wad of cash is never considered a good option – so companies have come up with better ones. Travellers Checks and Travel Card are two different types of current options that people can use when they are travelling. Before the start of 2000s, travelers check was a very popular from of foreign currency one could get their hands on before travelling abroad. These days they are a dying breed. For many people who are not familiar with these, travelers check are pre-paid pieces of paper that had currency stamped on them. These currencies were in numbers such as 20, 50, 100, etc. They were often issued in the home currency or a popular currency such as US dollars, UK pounds or Euros. The issuer would sign each note when the check was issued. He would then sign again when giving the check to a merchant as a form of payment. There was one problem though – checks were expensive. A person travelling from US would issuethe checks in USD, but if he travelled to, let’s say, China. He would have to convert the checks in Yen. He could still pay for things with the traveler checks but the place where he would give the check will convert the currency for him at a very low rate. This would result in the issuer paying more than he would if he would carry currency. However, travelers check do have their own benefits – in case they are stolen or lost, they can be replaced at no cost. Additionally, it doesn’t require an ATM or other computer based technologies. With the passing of the travellers checks and plastic taking over paper, many banks have now started promoting cards as a form of foreign currency. The newest trend is known as Prepaid Forex Card that work as credit cards or debit cards and they even look the part. Small 3.5” cards that can be loaded with any currency and sometimes with multiple currencies.The currency is often exchanged at a fixed rate when they are loaded with a small issuance fee for the card and a reload rate. The card has a limit of how much money is loaded on the card, after which more can be loaded at the then exchange rate. These cards can then be used at ATMs to withdraw cash, with a small fee of course. They can also be swiped at outlets and any places similar to a credit card or a debit card. There is no per transaction charge, so the issuer won’t be charged at every transaction. The card also comes with PIN facilities that make the card more secure. At the end of the trip, any extra money left on the card can be saved for a future trip or converted back to the home currency. With many places allowing cards, there are only few places that a person would require paper cash. 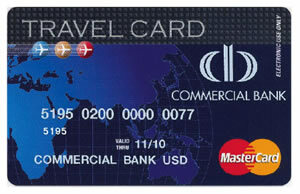 This makes the prepaid travel cards a more feasible option, as well a beneficial one. The card would also allow the person to refrain from carrying a wad of papers that can be easily stolen. A 1% to 4% charge is levied as commission by the business accepting it. The bank where the check is issued may also charge a small fee to issue the checks. A modest issuance fee is charged when the card is issued.